Finding the perfect red lipstick is like finding that perfect pair of jeans; it looks right, it feels right, it accents all your natural features, and you wear it with absolutely everything & anything. Unfortunately, there are so many red lipsticks out there that it can be hard to find the one right for you. Fortunately, I do have a couple favorite lipsticks that work very well with my skin tone. 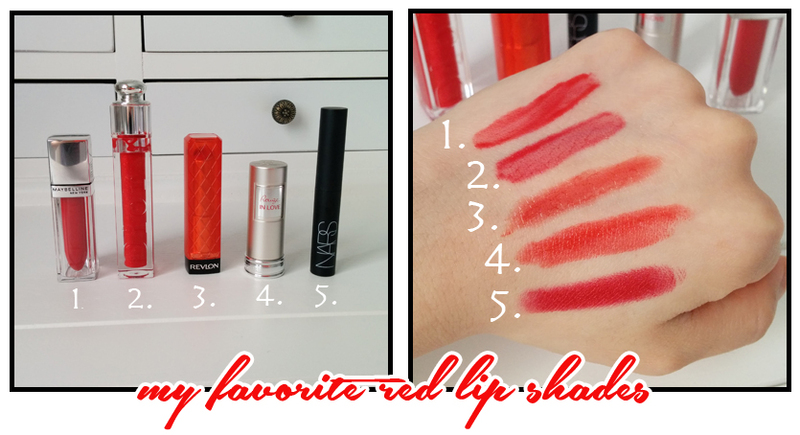 If you're interested in finding out some of my favorite red lipsticks, click through the jump! For reference, I have fair to light skin with yellow/golden undertones. I'm sorry I can't give you my MAC shade (I know, I know, it's the blogger standard but the only MAC foundation I've ever bought was MAC Face & Body - please forgive me! ), but I'm going to list what shade I am in other foundations so you can still get an idea. I wear the shade in the following foundations: Armani Luminous Silk 3, Chanel Vitalumiere Aqua B10, MAC Face & Body C1, Bobby Brown Warm Ivory, NARS Sheer Glow Gobi. [ 1 ] Maybelline Elixers - Signature Scarlet: creamy, pigmented, glossy, & cushiony finish. Leaves behind a light stain. [ 2 ] Dior Addict Lip Gloss - Little Red Dress: glossy, shiny, and slightly glittery. Doesn't last long, but since it's in a gloss formula it's easy to reapply. Unfortunately, I think the shade has been discontinued since Dior recently revamped the line. The token red Dior Addict lip gloss is called Rouge Defendu and may be similar. [ 3 ] Revlon Lip Butters - Candy Apple: balmy, slightly glossy, fairly pigmented. Lasts longer than a gloss, but shorter than a lipstick. [ 4 ] Lancome's Rouge in Love - Sequence in Love: highly pigmented, bright, moisturizing for a lipstick, long wearing, and leaves behind a stain. 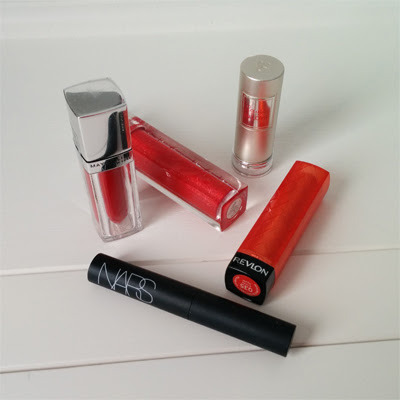 [ 5 ] NARS Pure Matte Lipstick - Vesuvio: superiorly pigmented, bold, matte finish, but requires a mirror to reapply. If you're wondering which shade is my favorite out of the five, it's hands-down Lancome's Rouge in Love. The formula is amazing - it's highly pigmented but it's actually moisturizing too! It's a hard combination to come by in lipsticks. It wears in my favorite finish, satin, and the packaging is so chic. 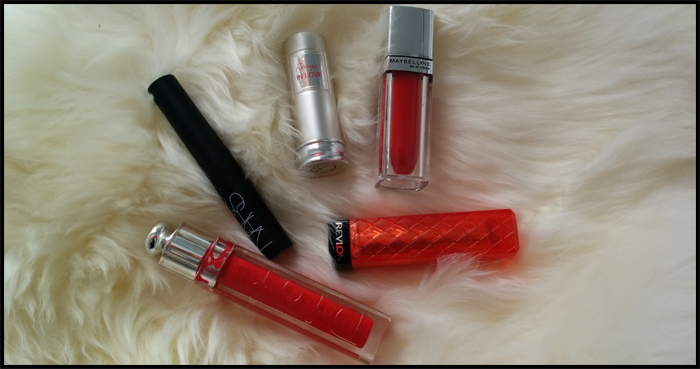 My favorite everyday shades have to be Revlon's Candy Apple Red and Dior's Little Red Dress. They're pigmented enough so you get the overall feel of a red lip, but are sheer enough so that you don't have to always use a mirror when applying them. Prep & moisturize: I can't stress this enough, especially if you're going to be wearing a red lip. If it's in a lipstick formula especially, all the dry and dead skin on your lips will be accentuated which is a big turn off. I like to use a sugar scrub first to exfoliate, and then slather on a balm to prep my lips. Use a Lip-liner for perfected lips: Most red lipsticks "feather" meaning that they will stray beyond the natural borderline of your lips. If you're aiming for that perfect pin-up girl red lip, it's best to use a lip-liner to get that shape. I admit, I don't always use my red-lip liner every time I wear red lips, but I do whip it out if I have to look extra put together. You don't have to get anything fancy, a normal drugstore lip liner will suffice. Layer different textures & formulas: To get a unique finish, try layering similar red shades but in different finishes. For example, I layer Signature Scarlet over NARS Vesuvio if I'm not feeling up to wearing a totally matte lip. The deep red color of Vesuvio is still there, but it's slightly more glossy due to the texture of Signature Scarlet. Experiment with different products to achieve a combination you love! Use your fingers to apply for a more natural finish: This is especially true for pigmented shades. If you don't have a mirror handy, you can just use your fingers to press the product on your lips for a more natural flush. The great thing about this method is that it doesn't have to be perfect, and it's a great way to ease into wearing a red lip during the day. Hope you find your perfect red lip!